A delightful way to review math facts. 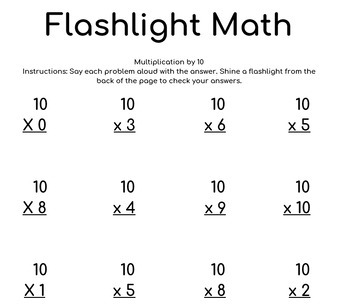 Your student shines a flashlight on the problem from behind the page and the answer "magically" appears. This bundle includes multiplication facts pages for 2s through 10s. Teacher/parent instructions are provided. Each pdf file includes three pages. Print the first two on cardstock and glue them together as instructed. Then give it to the student and let them have fun making the answer appear. Check out my other flashlight pages here on TpT.